Our poll for the Mail on Sunday on 25th March revealed that this year’s budget proved very unpopular, and at the height of the various controversies in the days after, we found that an 8-point lead had opened up for Labour. Two weeks later, the Labour lead has dropped back to 5% (do note the margin of error is just over 3%), however the Conservative vote share has continued to contract to levels not seen since the 1997 general election. While the budget seems to have been a largely neutral event for the Lib Dems, UKIP appears to be benefiting from some of the disaffection among Conservative voters, with the balance of the contraction of Labour and Conservative support being spread among the smaller parties. Conservative support has been further dented by the government’s handling of the events (“granny tax”, “pasty tax”, donor dinners, fuel shortage, surveillance powers) of the last two weeks, with 67% of respondents saying events were badly or very badly handled. Only 13% of respondents opted for well or very well. 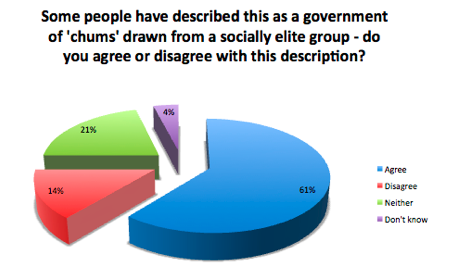 73% of respondents believe the Conservative party is out of touch with ordinary voters (17% in touch). Respondents believe David Cameron is more concerned by image (61%) than substance (24%) and 52% believe the rich have a disproportionate influence over the Conservative party (36% saying proportionate). Opinion is divided over Labour’s trade union influence, 44% saying the Trade Unions have a disproportionate influence while 38% say their influence is proportionate. When asked whether members of the Government are personally committed to their statement that “we’re all in this together”, an overwhelming 68% do not believe ministers are personally committed (vs. 17% that believe they are). 82% of respondents believe that neither David Cameron, Ed Miliband, George Osborne, Ed Balls or Nick Clegg have had any personal experience of having to “tighten their belts” due to financial constraints. There was little difference in perception between those individuals. The public still trust David Cameron (34%) more than Ed Miliband (26%) on the economy, although the fact that 40% don’t know suggests a lack of trust or conviction in both. George Osborne has slightly improved on this measure (since we asked the question two weeks ago) over Ed Balls 28% to 27%, again though, a high proportion (45%) of respondents not knowing. Personalities – Respondents check one or more boxes that they feel describe a politician best. While George Osborne is seen as out of touch, uncaring and not charismatic, David Cameron’s competence and charisma provides some balance. Both are seen as “snobbish”. Labour’s key issue in capitalising on Conservative weakness appears to be Ball’s and Miliband’s notable lack of charisma to voters (5% and 3% to Cameron’s 17%). Tony Blair is considered to be the most charismatic of all listed (32%) but had the lowest rating on trust (7%). Does being perceived as “posh” matter? Electorally, yes. While being “posh” made no difference to 62% of respondents, 34% said it would make them less likely to vote for a politician vs. only 4% saying more. Who is perceived to be the “most” in touch with ordinary voters? Although we would suggest that the lesser known on this list would be less likely to be selected, it is certainly interesting that Etonians Boris Johnson and George Osborne find themselves at opposite ends of the list. Most in touch with ordinary voters? Whom would voters most and least like to invite to their own houses for dinner? Although 34% of those asked would not like to invite any politician listed to dinner, the most popular potential dinner guest was Boris Johnson with 22% choosing the mayoral hopeful. Rival in the race for London mayor, Ken Livingstone was the choice of 6% of respondents. 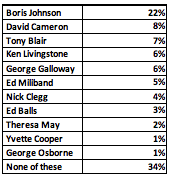 George Osborne was bottom of the pack with 1% choosing the chancellor. Cameron edged Miliband 8 % to 5% and despite respondents not rating him on trust, Tony Blair was close behind Cameron with 7%. Whom would voters most like to invite to their own houses for dinner? Least Like to Invite to Dinner? Who would respondents say is or was most concerned about their image? Most Concerned About Their Image? A straight fight between Blair and Cameron, with Blair just ahead. Events of The Last Two Weeks – Nasty Party? 47% of respondents said events since the budget had made them more likely to view the Conservative party as “uncaring” (26% of Conservative 2010 voters) (vs. 5% “caring and 43% “no change). What are the “main” parties for? Who do you think each of the main parties works most in the interests of? What do you think counts for more in the inner circle of each of the following? 63% selected the frock-coated David Cameron in the well-known Bullingdon club photograph. 37% selected the image of Cameron in casual clothes drinking a pint of beer in a pub. “Which politician do you think would drive the best bargain when purchasing an item at a car boot sale? -Either Balls is considered the best negotiator or possibly the most likely to ‘be’ at a boot sale? Survation interviewed 1,036 people online between April 5th abd 6th. Data were weighted to be representative of the UK public. Party Leaders – Who “Best Defends” Britain’s Interests?